Marrakesh – an intoxicating city that awakens your senses with a jolt as soon as you arrive. Marrakesh is an ideal hot winter holiday destination from the UK. It’s just 4 hours away, with no time difference and warm winters provide a great tonic when it’s grey in the UK. 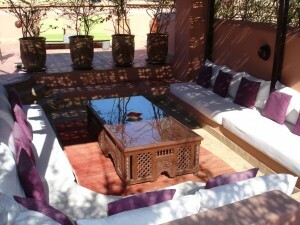 Riad Chergui is a stylish and peaceful riad, located in the heart of the medina in Marrakech. Overall: Raid Chergui is ideal for couples and families looking for an authentic, quiet but central, place to stay in Marrakesh. Location: Riad Chergui is in a great location, being in the heart of the medina in Marrakesh, but offering a peaceful retreat from the hustle and bustle of the streets. It’s only short walk from the taxi drop off point and the souks and a 10 minutes walk from Jemaa El Fna Square. Peaceful Retreat: Restored with Moroccan craftsmanship, Riad Chergui has two courtyards, a roof terrace, a 45m² swimming pool (unheated but great for those hot summers), a lovely lounge and lots of nooks and crannies to provide plenty of space to chill out and relax. What’s remarkable is that this peaceful retreat is only a few minutes from the souks! Accommodation: There are 9 charming rooms, tastefully furnished with both Moroccan and French influences. Each has a gorgeous, ensuite bathroom and airconditioning, too. The rooms either overlook the courtyard or the swimming pool. Good options are available for families as four of the rooms can take an extra bed and one of the rooms has 2 double beds. Breakfast is included and dinner can be taken too, with prior notice. Facilities: The riad has a massage room, located on the roof terrace and offers massage, manicure, pedicure and waxing. The lounge has a TV (and even a games console!) and a library of books, magazines and games for guests to use. Airport transfers can also be arranged which is recommended, especially on arrival. Service: Emmanuelle, Ilham and the rest of staff are discreet, helpful and courteous. The service at Riad Chergui is excellent. For more information and how to book, please contact me, Ching Lee, at Your Holiday Planner to help plan holiday or short break in Marrakech. This entry was posted in Family Friendly, Reviewed by Your Holiday Planner, Thoughtful travel, Your Holiday Planner at large and tagged Marrakesh, Places to Stay, Riad. Bookmark the permalink.